Welcome to the Aliventures shop! This is where you can get your hands on lots of writing goodies. If you’re after my Blogger’s Guides, those are sold here. If you’re interested in my online courses, you can find details of those here. Pssst … if you don’t yet receive the Aliventures newsletter by email, sign up for that first and you’ll get a 35% discount code for everything here. Get Writing is a 56-page ebook that offers a beginner-friendly guide to four areas: blogging, short stories, novels and freelancing. Each section has key tips, a detailed four week plan, plus “going further” suggestions. The ebook is designed to help you explore different types of writing – ideal if you want to write but you don’t know what, or if you’d like to try something new. #3: An exclusive discount code that gets you 50% off my other downloadable products. The Self-Study Seminar Packs each contain four full seminars, plus transcripts and worksheets, from my Writers’ Huddle site (which ran Feb 2012 – Apr 2018). 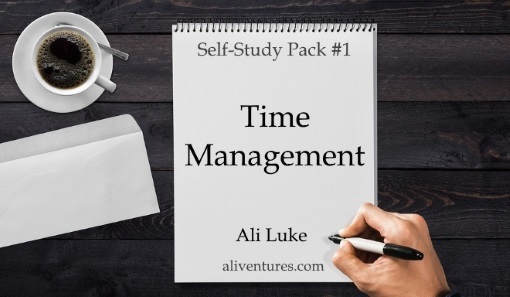 The Time Management Pack (#1) – which covers making time to write (however busy you are), better planning, conquering procrastination and writers’ block, and being a successful writer. The Craft of Fiction Pack (#2) – which covers writing dialogue, using flashbacks effectively, structuring and pacing your scenes and writing descriptions. The Self-Publishing Pack (#3) – which covers key writing milestones to celebrate, how to use Styles in MS Word, how to publish an ebook on Amazon, and how to craft a great blurb. The Freelancing Pack (#4) – which covers reasons to freelance, how to be a freelance copywriter or editor, how freelancing intersects with entrepreneurship, and how to find clients. The Advanced Fiction Pack (#5) – which covers finding and evaluating story ideas, writing great heroes and villains, handling viewpoint, and adding depth to your characters. The Novel Editing Pack (#6) – which covers structuring and outlining your novel, revising, and goes into detail about the revising and editing process, including how to keep track of everything. They cost $20 each, but you can get all six for just $50 (saving $70, compared with buying all six individually for $120).